ABOARD THE AMASONATA – For those who take a cruise for the scenery, today was the highlight of the week. 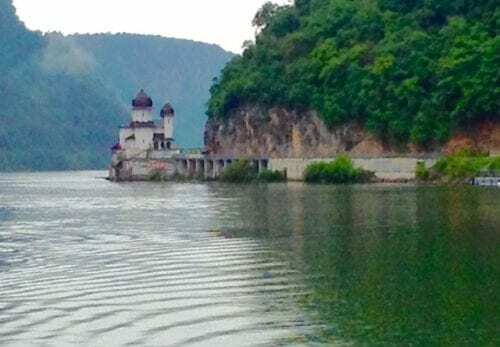 Instead of cities and wineries and fortresses and war monuments, we are heading into the “Iron Gates,” the most spectacular section of the Danube River. The Iron Gates are a beautiful set of gorges with the Carpathian Mountains on one side and the Balkans on the other. The Danube here represents the border between Romania and Serbia and at its narrowest part — 500 feet — it becomes the shortest distance between the two countries. 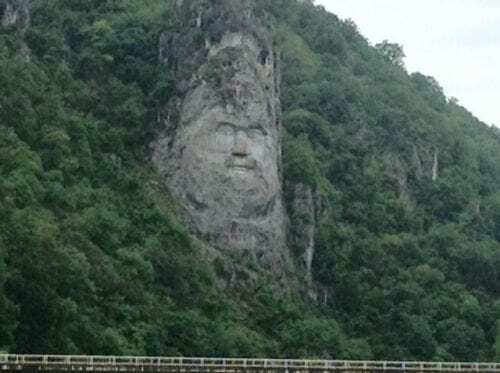 For 84 miles, the Iron Gates could as well be one of the Norway fjords for its towering, moss–covered green mountainous rocks on either side. Here and there a castle or a monastery perches alone at the top of a cliff, a Roman ruin, and at its end sits a dam with two hydro-electric power stations and two locks. We’ll be on the river all day. This is the only excursion-free day during the week-long cruise. 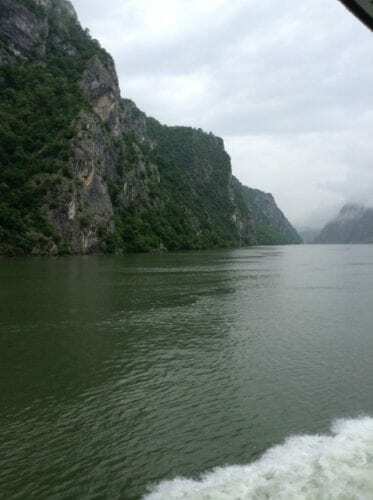 It wasn’t always smooth sailing through this stunning stretch of river; the rocks and the rapids made traveling through the gorges in a boat extremely dangerous, if not impossible sometimes. After 1971, though, when the power station was built and the dam system created, raising the water level, large ships and riverboats could finally sail smoothly through the gorges, as the AMASonata did today without a ripple or a scratch on the bottom. Because the water level was so much higher after the dam was built, half a dozen villages along the water, with 17,000 people, had to be relocated to higher ground, and the villages have been settled now on the mountainsides and can be seen from our boat as we pass them by. They, and the Romans, were not the first inhabitants of this lovely area; in the 1960’s an archeological survey unearthed some statues here from the Neolithic period. Passage through the Iron Gates took most of the morning, and when we reached the other side of the gorges and flatter land, we entered yet another country on this five-nation cruise. We are now in Bulgaria, docked beside the town of Vidin, which had its heyday in the 14th Century but still is home to the second largest Orthodox cathedral in Bulgaria and the Baba Vida fortress, which today serves as a backdrop for theatrical performances. While waiting for the ship to dock, our cruise manager Maddy Caldaruse, who grew up in nearby Romania, gave a talk on “Communism From an Insider.” This was at the request of passengers who knew she had experienced a childhood under the dictatorship of Nicolae Ceausescu and the Communist party when the Romanian elections were corrupted and the king was exiled, just after World War II. “They called what they did to us ‘collectivization,’ “ Caldaruse remembered. “It meant that my mother’s family, which was wealthy, had to give up their house to the government. My mother was 10 at the time. They took her father (my grandfather) away and kept him in prison for days, until he signed the papers to give them his house. On the other hand, Caldaruse’s father, an Italian immigrant with no money, was given a house and land. But Ceausescu needed to pay back many debts and so he began rationing food to accomplish this. As an elementary-aged child, Caldaruse and her sister had to wait in line for five and six hours for a piece of salami, while their mother lined up for dairy products once a week. In 1989, after citizens demanded “No More Ceausescu,” and a coup d’etat eliminated him, the Communist countries in the area gradually changed over to democracy, with Russia the last country to change. “The only good thing about communism,” Caldaruse told us, “was the education. 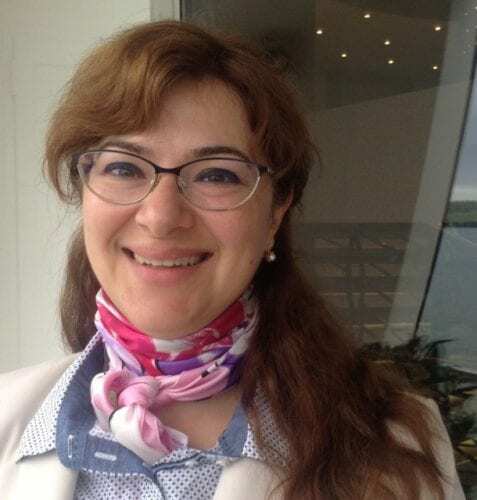 We didn’t have any smart digital devices, or television entertainment, to distract us from school and we had many, many books, so all we could do was read,” she laughed, as we pulled into the dock at Vidin, Bulgaria.